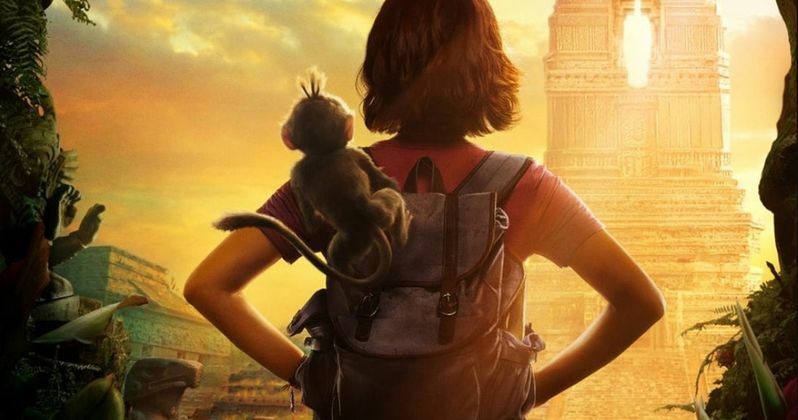 We have the first trailer for Dora and the Lost City of Gold. This is a project that has been in the works for some time. We first learned about it back in October 2015, before it really picked up heat two years later in October 2017. The wait is finally over, be it for young adults who are feeling nostalgic about a significant piece of their childhood, or for younger viewers who are interested in the character at present. Dora the Explorer is here for her first big screen, live-action adventure. Isabela Moner is at the center of the project as Dora. The actress is best known for her roles in Transformers: The Last Knight and Sicario: Day of the Soldado, This is, naturally, aiming for a slightly different audience, but she certainly looks the part. Eva Longoria, formerly of Desperate Housewives fame, is on board as her mother, with Ant-Man and the Wasp star Michael Pena as her father. Benicio Del Toro, who starred alongside Moner in Sicario: Day of the Soldado, will voice the evil Swiper the Fox. Diego, meanwhile, will be played by Jeffrey Wahlberg (Future World). It was announced recently that the trailer was set to make its debut during the Kid's Choice Awards, which seems like an appropriate place to drop a trailer such as this. What's more is that Danny Trejo made the announcement himself, while confirming that he's set to voice Dora's companion Boots, to the delight of many on the internet. While there may not be a ton of adult Dora the Explorer fans out there, this movie has assembled an interesting cast. Dora and the Lost City of Gold centers on Dora, who has spent most of her life exploring the jungle with her parents. However, now she is going to have to navigate a very different kind of adventure, the treacherous jungle known as high school. Dora quickly finds herself leading her monkey pal Boots, her human buddy Diego and a group of other teens on an adventure to rescue her parents, which also happens to involve the mystery behind a lost Inca civilization. Dora the Explorer debuted in 2000 and proved to be a huge hit for Nickelodeon, ultimately running for eight seasons, producing 172 episodes. The show wrapped up in 2014 but remains on the air via reruns. James Bobin, known for his work on Alice: Through the Looking Glass, The Muppets and Muppets Most Wanted, is in the director's chair for this one. He's working from a screenplay by Nicholas Stoller and Danielle Sanchez-Witzel. At one point, strangely, it looked like Michael Bay, of all people, was on board to produce the movie. That didn't pan out and it's probably for the best. Dora and the Lost City of Gold is set to be released by Paramount Pictures on August 2. Be sure to check out the brand new trailer for yourself.